Fried chicken might not be some people's idea of a healthy breakfast but this is one way to wean my 6yo from processed food. 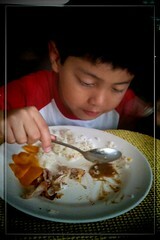 Here, he's having home-cooked fried chicken with liver sauce, fresh mango and rice. It could be better, but it's a start. it's a good start. try cooking na kasi. you have to learn especially if you're retiring very soon..hehe.